The two leading candidates for the presidency of Brazil's ruling Workers Party will face a run-off vote against each other, officials said. Former minister Ricardo Berzoini led the original poll but did not receive enough votes for an outright victory. 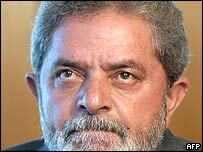 He now faces second-placed candidate Raul Pont, a former mayor of the southern city of Porto Alegre. Previous president Jose Genoino resigned in July after the party admitted to receiving illegal funds. The Workers Party's reputation for integrity was hit by the corruption scandal that forced the resignation of three other senior officials. The run-off vote between the two candidates will take place on 9 October.